YOUNGSVILLE – A team of first responders in Franklin County, used to saving lives, are dealing with a tragedy of their own this holiday weekend. Funeral plans are being finalized in Youngsville, for a 30-year veteran volunteer firefighter, who suddenly died on Christmas Day. Loved ones say Youngsville Assistant Fire Chief Jeff Fields died on Christmas morning after suffering a heart attack on December 13. He had recently undergone a successful heart bypass surgery, and was even in church with his family on Christmas Eve. He leaves behind a wife and two children ages 14 and 19. Facebook pictures tell the story of a man who was brave enough to run into a burning building, and also brave enough to, well, put on a dress and a wig for a charity fundraiser. “He always had a good attitude. And at a time, when you’re not necessarily feeling good, or having a bad day, having Jeff around always made you feel a little better,” Williams said. Loved ones say he was also generous. “He would take the shirt off his back and give it to anyone that was in need,” Williams said. Some say that was the truth. Just ask one of the many young firefighters Fields mentored through rookie training. A funeral is planned for Saturday December 28 and 3:00. Visitation is scheduled at Youngsville Fire Station One at 803 Wheaton Avenue from 12:00 p.m. To 2:30 p.m.
Visitation on December 28, 2013 at Youngsville Fire Department Station 1, 803 Wheaton Ave. Youngsville, NC 27596. On the evening of Thursday December 12th, 2013, Assistant Chief Jeffery “Jeff” Lee Fields responded to a motor vehicle accident. 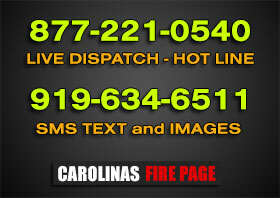 The next morning Assistant Chief Fields experienced a medical emergency and was transported to Wake Medical Center. He remained in the hospital for a week and a half and then was released to come home by medical staff. Assistant Chief Fields passed away at his home on the morning of December 25, 2013. Assistant Chief Fields served with the Youngsville Volunteer Fire Department for thirty years. Special Notification: Any fire apparatus attending the visitation and funeral is requested to stage on Wheaton by way of Park Ave (US-1 Alternate) to Franklin Park Drive. Memorial contributions may be made to the North Carolina Fallen Firefighters Association, 2501 Blue Ridge Road, Suite 250, Raleigh, NC 27607 or to the YoungsvilleBaptist Church, Window Preservation Fund, P.O. Box 297, Youngsville, NC 27596.